With selections from an actual press release that came across my desk. They didn't mention whether they have a gimp. "A splendid, unique experience in the Netherlands! The Amsterdam Dungeon brings the most horrific periods of Dutch history back to life." You'll laugh at hilarious medieval escapades like witch burnings, the inquisition and the bubonic plague! "A simulation of a Far East Indies ship emphasizes the experiences of those who were forced to work on board." "*Not suitable for children under 8 because of the true-to-life experience." What's next, the Red Light District as conceived by Disney and the Muppets? I've been there and had a lot of fun. 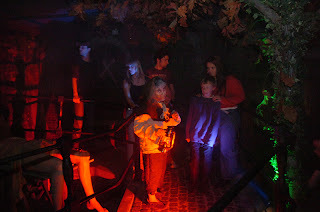 Combination between a museum with actors (who are doing their best to scare you) and a house of horrors you'll find at carnivals. I.m.o. an ideal outing for (female) stagparties :-)). Hmmm...maybe I should go have a look instead of making fun of them. But the press release struck me kind of funny.